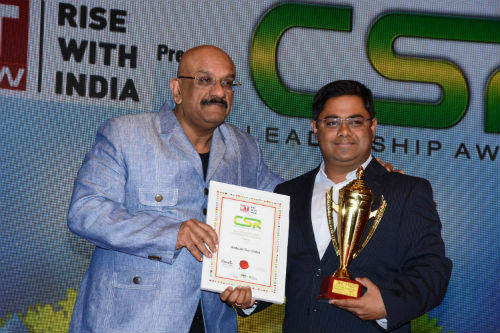 Udaipur: Hindustan Zinc has received ET Now CSR Leadership Awards – 2018 in Best CSR Practices Category organized by World CSR Day on 18th February, 2018 at Hotel Taj Lands, Mumbai. The award ceremony saw participation of over 200 companies in different categories. The esteemed Jury members of Award Function especially highlighted and appreciated Hindustan Zinc’s two of the flagship programs – Sakhi and Shiksha Sambal. World CSR Day is an independent and not-for-profit organization guided by Advisory Council. Their purpose is to make “work and working lives better”. On behalf of Hindustan Zinc, the award was received by Mr. Vijay Jayarama Murthy – Dy. Chief Marketing Officer from Dr. R.L. Bhatia – Founder, World CSR Day & World Sustainability. Mr. Mukul Bedi – Country Manager, Marketing also gave the presentation on Hindustan Zinc’s various Community Development Initiatives which was well received by the audience. Hindustan Zinc is committed to the principles of harmonious and sustainable development; protecting human life, health and environment, ensuring social well-being and adding value to the communities. We respect human dignity and believe in inclusive and equitable growth and improvement in quality of life and that lies at the core of our business philosophy and business operations. With focus on Child Care – Nand Ghar & Khushi; Education – Shiksha Sambal, Unchi Udaan & Jeevan Tarang; Sustainable Livelihoods – Hindustan Zinc Mining Academy & Samadhan; Women Empowerment – Sakhi; Sports – Hindustan Zinc Football Academy; Health – Vedanta Hindustan Zinc Heart Hospital & Health Camps; water & sanitation, culture, environment and community development including community assets creation, the programs encourage community participation. The Company is able to reach out to over 500,000 rural communities through CSR programs.